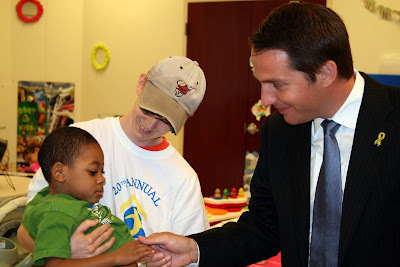 U.S. Rep. Glenn Nye dropped by St. Mary’s Home for Disabled Children for a tour this week. One of his stops included the classroom of the Early Intervention Program for the Home’s youngest residents. He shook hands with 3-year-old Jahmari, who was being held by recreational therapy assistant Shaun Stauffer. St. Mary’s Home is located within Nye’s district, the 2nd District of Virginia, which stretches along the eastern side of the state.